and Blue can be choosing. much anything you need for a day at the beach or pool. is long enough for most people. through the bottom of the tote. Top zipper: Top zipper design to protect the items running out. drying mesh which allows airflow to your damp towels to avoid bad odors. 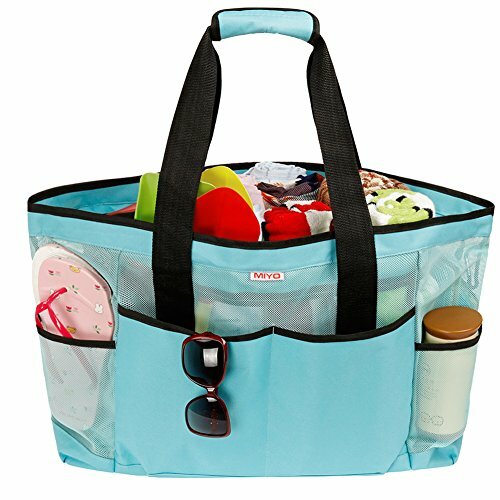 Huge Reusable Mush Beach Bag - being a 20*15*7.5 inch beach tote allow you to carry all you need and more for your day ahead, including 4-6 packs roll towels, favorite magazines , books snacks, children toys ,sunscreen, key, shoes, diapers, hats, glasses etc at the beach or pool. 9 Big Exterior Pockets with Large Capacity-The beach tote bag has 9 packs convenient pockets and compartments that will help you carry all your beach essentials and stay organized at all times, including one inside waterproof zippered pocket (11*9 inch) for valuables safe that is large enough for my tablet. one Non-perspective pocket for Protecting your private items from others，your bag contents are not completely visible to the world. Waterproof Base and Top zipper - With a waterproof base layer at the bottom of the bag so you can put the tote bag down on wet sand safe in the knowledge that no dampness will come through the bottom of the tote. the bottom has a solid waterproof lining to keep sand out.Also, by being easily fold-able this lightweight travel tote bag is perfect for taking on vacation,Top zipper design to protect the items running out. Sturdy Shoulder Straps and Key Chains - with long comfortable sturdy shoulder straps which is long enough for most people and double secure convenient internal carabineer hooks for car keys permits you to keep your keys safe and easily locate them at the end of the day. Premium Quality -Made from 600D water resistant polyester and extra strong durable quick drying mesh which allows airflow to your damp towels to avoid bad odors. Buy today and get our no quibble 12 month guarantees. The perfect beach or summer gift! If you have any questions about this product by MIYO, contact us by completing and submitting the form below. If you are looking for a specif part number, please include it with your message.